Draft: 2004, Tampa Bay Devil Rays, 2nd rd. Reid Michael Brignac...Graduated from St. Amant (LA) High School...He and his wife, Lauren have one son, Reid Jr. Spent the season with Triple-A Fresno...Clubbed 13 home runs, his most in a season since 2007...Signed with the Astros as a Minor League free agent with an invite to 2017 Spring Training. Spent his 12th professional campaign with the Miami organization, and the majority of the season with the Triple A New Orleans Zephyrs...opened the 2015 campaign with the Zephyrs and played in three games before joining Miami on April 13...played in 17 games for the Marlins from April 13 through May 7 and batted .077 (1x13)...was designated for assignment on May 8, and outrighted off the 40-man roster on May 11...on April 27, served as a pinch-runner for Miami in the bottom of the 8th inning (scored a run) after playing in New Orleans' afternoon affair as a defensive replacement in left field (1x2)...opened and closed out the season strong posting a .320 (33x103) batting average with six doubles, one home run, 17 runs and a .413 on-base percentage through his first 27 contests (April 9-June 18) with New Orleans...wrapped up the season batting .353 (42x119) with 10 doubles and 15 RBI over his final 30 contests (Aug. 2-Sept. 7) of the year...in between those two stints, went 18x125 (.144) over 36 contests. Traded to COL on 2/14...Appeared in 29 games before being designated for assignment on 5/16; was traded to NYY the following day...Batted .114 (5-44) before being designated for assignment again on 6/21; elected free agency on 6/24...Signed a minor league contract with COL on 6/28...Assigned to Colorado Springs (AAA) where he spent the remainder of the season...Was on the 7-day DL, 6/30-7/6 (left wrist sprain)...Batted .250 (4-16), 2B, HR, 4 RBI as a pinch-hitter. Made his 3rd Opening Day roster but only played 16 games over 2 stints in the majors with TB...Optioned to Durham (AAA) on 4/21 after batting .118 (2-for-17) with no XBH over the team's first 20 games...Recalled on 9/1 and appeared in 8 games, all as a defensive replacement, including 4 appearances at 3rd base, his first career action there...Played SS (74 G), 2nd base (21 G) and DH (4 G). Spent the majority of the season in the majors and played in 92 games, making a team-high 76 starts at shortstop...was the Opening Day shortstop and made his second Opening Day roster...had an 11-game stint in Triple-A Durham from July 23-Aug 9...Compiled a .979 fielding pct., committing only 7 errors...if he had enough games to qualify this would have ranked 5th among AL shortstops and 3rd best in club history behind Chris Gomez (.980 in 2002) and Kevin Stocker (.979 in 1998)...Is a career .244 (133-for-544) hitter vs. RHP with all 10 of his HR...has a .160 (17-for-106) mark vs. LHP...Batted .193 (48-for-249) with 1 HR and 15 RBI...among major leaguers with 200 or more AB, had the 8th-lowest batting avg., 4th-lowest OBP (.227), the lowest SLG (.221) and tied for the fewest extra-base hits (5)...Had 1 extra-base hit in his first 51 games played, a double on May 12 at CLE in his 83rd at-bat of the season...that snapped a club-record drought of 104 AB without an extra-base hit, dating back to Sep 22, 2010...it lasted 35 games, also a club record...the prev. record was held by Jason Bartlett (29 games and 100 AB, May 13-June 15, 2008)...Hit his only home run of the season on June 8 at LAA...had gone 146 AB without a home run, dating back to Sep 18, 2010 vs. LAA...also in that game, his sac bunt in the 10th inning off Fernando Rodney scored the winning run (John Jaso)...Was optioned to Durham on July 23 as Desmond Jennings was recalled...hit .231 (9-for-39) with 1 HR and 4 RBI while leading off and playing shortstop for the Bulls...was recalled on Aug 10...POSTSEASON: Appeared in 3 games during the ALDS vs. Texas...started Game 3, going 0-for-1 with a walk. Rookie made his first Opening Day roster atthe age of 24 and spent the entire season inthe majors. ... Appeared in 113 games, splitting time betweensecond base (68 games, 38 starts)and shortstop (50 games, 37 starts) ... alsoappeared in two games in right field, his firstoutfield action at any level. ... Started 63 of the team's first 111 gamesthrough Aug 8...from May 30-June 15, filledin at shortstop for Jason Bartlett (right hamstringstrain) starting 13 of 14 games in hisabsence...hit .304 (14-for-46) during thatstretch...from Aug 9 through season's end,started only 12 of the final 51 games. ... Went 7-for-25 (.280) with 6 RBI as a pinch-hitter...his 7 pinch hits tied teammate Willy Aybarand MIN Jim Thome for the AL lead...6 RBIranked 5th in the AL. ... Ranked among AL rookie leaders with 45 RBI(3rd), a .256 average (tied for 4th), 8 home runs(tied for 5th) and 39 runs scored (tied for 5th). ... Half of his 8 home runs were hit in 6 gamesbetween July 17-25, coming on the ninegameroad trip to New York-AL, Baltimore andCleveland out of the All-Star break. ... Batted .311 (33-for-106) in 39 games throughMay 30 ... after that, hit .226 (44-for-195) in 74games. ... On Sep 13 vs. NYY, hit a walk-off homer in the11th off Sergio Mitre for a 1-0 win...it was hisfirst game-ending hit or RBI...marked the first1-0 walk-off win or 1-0 extra-inning win in franchisehistory ... became the first AL player to hita walk-off homer in extras for a 1-0 win sinceBAL Aubrey Huff, May 9, 2007 vs. TB...was thefirst rookie to end a 1-0 game with a walk-offhomer since LAD Russell Martin on Aug 13,2006 vs. SF. ... On July 18 vs. NYY hit a career-high 2 HR and5 RBI while batting 9th ... became the 3rd rookieall-time to collect at least 2 HR and 5 RBI ina road game vs. New York, joining DET HarryDavis in 1932 and BOS Jason Varitek in 1998. ... On April 27 vs. OAK homered off Ben Sheets,a fellow alumnus of St. Amant (La.) HighSchool ... was his first career homer at TropicanaField. ... Won the Al Lopez Award for top Rays rookiein spring training ... hit .350 (21-for-60) with 4doubles and a team-high 18 RBI (tied for 2ndin Grapefruit League, tied for 3rd in AL), oneshy of Jose Guillen's spring club record (19 in2001)...played all 28 games at SS, 2B and 3B. ... Entered the season rated by Baseball Americaas the No. 5 prospect in the Rays farm systemand the organization's Best Defensive Infielderfor a third straight season. Twenty-three-year-old had three differenttours with the Rays: May 22-June 15,Aug 15-18 and Sep 3 through season's end...played in 31 games, 23 starts (22-SS, 1-2B)....Was initially recalled from Triple-A Durhamon May 22 and filled in for the injured JasonBartlett...appeared in 21 of 22 games after thecall-up, including 16 starts at shortstop...wasoptioned back to Durham on June 16 whenBartlett was reinstated...hit .271 (16-59) duringthat first stint....Entered as a defensive replacement the nighthe was recalled, May 22 at FLA, and collectedhis first ML hit (single off Renyel Pinto)....On May 25 at CLE recorded his first ML RBI ona 2-run single off Fausto Carmona....Was recalled for a final time Sep 3 for middleinfield depth and hit .333 (9-27) in 9 gamesover the season's final month....Had a career night Sep 14 at BAL, going 4-for-4 with his first ML HR (David Hernandez), 2 2B,3 RBI and 1 SB...tied the club rookie record forhits and extra-base hits (3) in a single game....Batted .282 (117-415) with Durham over 96games this season....Was the starting shortstop for the InternationalLeague at the Triple-A All-Star Game July 15 inPortland, Ore., and went 1-for-3 with a doubleand an RBI....Named IL's best defensive shortstop by BaseballAmerica for the second straight season ina poll of league managers....After the season was rated by Baseball Americaas the No. 5 prospect and best defensiveinfielder in the Rays org. Was selected from Durham on July 3, 2008when Jason Bartlett was placed on the 15-day DL with a right knee sprain...played 4games for the Rays, all at shortstop, including2 starts...Started at shortstop and batted 9th in his majorleague debut July 4 vs. KC...went 0-for-3with a walk and scored in the 11-2 win overthe Royals...handled 8 chances at shortstopwithout an error...Was named an International League midseasonAll-Star just prior to his promotion...ledthe IL with 24 doubles at the time of his call-upand was hitting .265 with 7 HR and 38 RBI in78 games for the Bulls...Was optioned back to Durham on July 15...season was cut short on Aug 6 when he washit by a pitch from Jo-Jo Reyes at Richmond(Braves), breaking his wrist...Named the IL's best defensive shortstop byBA...also named the Rays No. 4 prospect (upfrom No. 5) and best defensive infielder for asecond straight season. Led the Southern League in runs scored (91), total bases (228) and extra-base hits (52) in helping lead AA Montgomery to its 2nd consecutive Southern League championship...was also 3rd in RBI (81) and 5th in hits (137)...Was 3rd in the Southern League with 133 games, all starts...made 127 starts at shortstop, the rest at DH...Was hitting .305 (HR-4, RBI-20) in his first 24 games, then went cold in June and July batting a combined .210 (44-210) in a 54-game span thru July 1...rebounded to hit .288 (64-222) in the final 58 games of the season including .344 (21-61) with 14 RBI and 15 runs in the final 16 games...Led Southern League shortstops in total chances (595), assists (394), double plays (76) and errors (22)...made only 3 errors in his last 43 games...Batted 43 points higher vs. lefthanders (.286) than righthanders (.243)...batted .177 (20-113) in 26 games for the Scottsdale Scorpions in the 2007 Arizona Fall League. At 20 years old, combined to hit .321 with 24 home runs and 99 RBI at Class-A Visaliaand Double-A Montgomery in 2006, the fourth-highest average among all minor league shortstops...also ranked in the top 10 among all minor leaguers with 167 hits (sixth), 100 runs (ninth) and 281 total bases (sixth)...Earned Rays Minor League Player of the Year honors as well as California League MVP and Cal League Rookie of the Year accolades...Named the starting shortstop on Baseball America's All-Minor League All-Star Team after leading everyone at his position in RBI and runs scored (100) and ranked 5th in home runs...no other shortstop matched his totals in homers, average, and slugging percentage (.539)...His 167 hits were second in the organization to Fernando Perez (168)...Earned Rays Minor League Player of the Month awards for April and June, the only prospect to win the monthly honor twice...Set single-game career highs with 3 home runs and 8 RBI on April 12 at Bakersfield (Rangers), as the Oaks combined to tie a Cal League team record with 8 homers...Was the starting shortstop during the Biscuits' Southern League championship run...collected two doubles and a home run in the playoffs...Ranked as the third-best prospect in the Rays organization, the top prospect from the California League and the 2nd-best prospect at shortstop by Baseball America...Baseball Digest named him the 14th-best prospect overall. Named a Midwest League All-Star in 2005 leading SW Michigan with 15 homers and 29 doubles...Rated the Rays best infield prospect and 5th best overall in the organization by Baseball America despite leading the Midwest League with 38 errors. Drafted by the Rays in the second round of the 2004 June Draft and began his pro career with rookie Princeton...Batted .567 (17-for-30) with 14 RBI in his first seven games including a home run (2nd AB) and 5 RBI in his professional debut August 4 at Greeneville (Astros)...Closed out the year with a 13-game hitting streak and 15 RBI over the stretch...Tabbed by Baseball America as the 4th-best prospect in the Appy League and the 5th best in the organization. 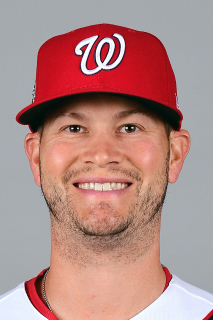 March 24, 2018 Washington Nationals released SS Reid Brignac. February 13, 2018 SS Reid Brignac assigned to Syracuse Chiefs. January 31, 2018 Washington Nationals signed free agent SS Reid Brignac to a minor league contract and invited him to spring training. November 7, 2017 Yaquis de Obregon activated SS Reid Brignac. November 6, 2017 SS Reid Brignac elected free agency. November 2, 2017 Yaquis de Obregon placed SS Reid Brignac on the reserve list. October 24, 2017 SS Reid Brignac assigned to Yaquis de Obregon. August 19, 2017 Fresno Grizzlies activated SS Reid Brignac from the 7-day disabled list. August 12, 2017 Fresno Grizzlies placed 2B Reid Brignac on the 7-day disabled list retroactive to August 11, 2017. December 19, 2016 2B Reid Brignac assigned to Fresno Grizzlies. December 9, 2016 Houston Astros signed free agent 3B Reid Brignac to a minor league contract and invited him to spring training. October 3, 2016 2B Reid Brignac elected free agency. May 30, 2016 Atlanta Braves sent 2B Reid Brignac outright to Gwinnett Braves. May 2, 2016 Atlanta Braves selected the contract of Reid Brignac from Gwinnett Braves. November 5, 2015 3B Reid Brignac assigned to Gwinnett Braves. October 23, 2015 Atlanta Braves signed free agent 3B Reid Brignac to a minor league contract and invited him to spring training. October 5, 2015 3B Reid Brignac elected free agency. June 2, 2015 New Orleans Zephyrs activated 3B Reid Brignac from the 7-day disabled list. May 21, 2015 New Orleans Zephyrs placed 3B Reid Brignac on the 7-day disabled list. May 11, 2015 Miami Marlins sent 3B Reid Brignac outright to New Orleans Zephyrs. May 8, 2015 Miami Marlins designated 3B Reid Brignac for assignment. April 27, 2015 3B Reid Brignac assigned to New Orleans Zephyrs. April 13, 2015 Miami Marlins selected the contract of 3B Reid Brignac from New Orleans Zephyrs. December 9, 2014 Miami Marlins invited non-roster 3B Reid Brignac to spring training. December 7, 2014 3B Reid Brignac assigned to New Orleans Zephyrs. November 18, 2014 Miami Marlins signed free agent 3B Reid Brignac to a minor league contract. September 30, 2014 3B Reid Brignac elected free agency. August 25, 2014 Philadelphia Phillies sent 3B Reid Brignac outright to Lehigh Valley IronPigs. August 23, 2014 Philadelphia Phillies designated 3B Reid Brignac for assignment. July 21, 2014 Philadelphia Phillies activated 3B Reid Brignac from the 15-day disabled list. July 16, 2014 Philadelphia Phillies sent 3B Reid Brignac on a rehab assignment to Clearwater Threshers. May 9, 2014 Philadelphia Phillies selected the contract of 3B Reid Brignac from Lehigh Valley IronPigs. March 30, 2014 SS Reid Brignac assigned to Lehigh Valley IronPigs. November 20, 2013 Philadelphia Phillies signed free agent SS Reid Brignac to a minor league contract and invited him to spring training. November 20, 2013 Reid Brignac assigned to Lehigh Valley IronPigs. November 4, 2013 3B Reid Brignac elected free agency. July 7, 2013 Colorado Springs Sky Sox activated 3B Reid Brignac from the 7-day disabled list. June 28, 2013 Colorado Rockies signed free agent SS Reid Brignac to a minor league contract. June 28, 2013 SS Reid Brignac assigned to Colorado Springs Sky Sox. June 25, 2013 SS Reid Brignac elected free agency. June 24, 2013 New York Yankees sent Reid Brignac outright to Scranton/Wilkes-Barre RailRiders. June 21, 2013 New York Yankees designated Reid Brignac for assignment. May 18, 2013 Colorado Rockies traded SS Reid Brignac to New York Yankees. May 18, 2013 Colorado Rockies traded Reid Brignac to New York Yankees. May 16, 2013 Colorado Rockies designated Reid Brignac for assignment. February 14, 2013 Tampa Bay Rays traded SS Reid Brignac to Colorado Rockies. February 5, 2013 Tampa Bay Rays designated Reid Brignac for assignment. September 1, 2012 Tampa Bay Rays recalled Reid Brignac from Durham Bulls. April 21, 2012 Tampa Bay Rays optioned Reid Brignac to Durham Bulls. August 10, 2011 Tampa Bay Rays recalled Reid Brignac from Durham Bulls. July 23, 2011 Tampa Bay Rays optioned Reid Brignac to Durham Bulls. May 25, 2011 Reid Brignac roster status changed by Tampa Bay Rays. May 22, 2011 Tampa Bay Rays placed SS Reid Brignac on the bereavement list. December 8, 2009 SS Reid Brignac assigned to Venados de Mazatlan. September 3, 2009 Tampa Bay Rays recalled Reid Brignac from Durham Bulls. August 19, 2009 Tampa Bay Rays optioned Reid Brignac to Durham Bulls. August 15, 2009 Tampa Bay Rays recalled Reid Brignac from Durham Bulls. June 15, 2009 Tampa Bay Rays optioned Reid Brignac to Durham Bulls. May 22, 2009 Tampa Bay Rays recalled Reid Brignac from Durham Bulls.